Ok, so I feel totally ridiculous writing this review. Yes, Slimfast. No, I did not seek out Slimfast products. No, I am not on a diet. But, they showed up on my doorstep, and what choice did I have but to try them? Slimfast makes bottled protein meal shakes, in a variety of flavors: French Vanilla, Creamy Milk Chocolate, Rich Chocolate Royale, Strawberries n' Cream, Cappuccino Delight, and the interesting sounding Piña Colada, along with High Protein versions of Vanilla Creme or Creamy Chocolate. Most flavors are also available as powders, so you can mix them at home with your favorite milk base. Nutritionally, they seem pretty good: 1 bottle is 180 calories, 6g fat, 18g sugar, and 10g protein. Fairly balanced. The High Protein line is still 180 calories, but has 9g fat, only 2g sugar, and a whopping 20g protein. And at first, the ingredient list isn't too scary: fat free milk and milk protein concentrate make up the dairy base, rounded out by water and sugar. And ... canola oil. But the ingredients quickly get totally unrecognizable, and the list is not short. I can't say that these seem like they are actually good for you. Slimfast also makes protein meal bars, that are supposed to seem decadent, like eating candy bars, but are only 200 calories, and complete with 8g protein. They do sound good, at least in name: Chocolate Peanut Caramel, Sweet & Salty Chocolate Almond, Chocolate Fudge Brownie, Chocolate Cookie Dough, Chewy Chocolate Crisp, and Have Your Cake. And finally, they make smaller snack bars, 100 calories, but with only a single gram of protein, again in tempting sounding flavors: Double-Dutch Chocolate, Peanut Butter Crunch Time, Chocolate Mint, Greek Yogurt & Honey. I can't tell you about any of the bars, as I only tried the shakes. And, I'll be honest, I expected to take a single sip, gag, and move on. But I didn't. I tentatively took a small sip. And then a gulp. And then I pulled out a straw, and downed the entire thing. Wow, it was actually good! It was thick and creamy, like a milkshake. The strawberry flavor didn't exactly taste like ripe, fresh strawberries, but it also didn't taste like fake sweetness. It was truly tasty. The thing that really surprised me about these was how filling they are. Sure, everyone says that about their diet products, but I didn't expect it. Even by the final bottle, I was still shocked when I'd have one with my breakfast, feel beyond stuffed, and not want any other food for a few hours. I tend to snack and munch on things all day long, and when I had the first couple bottles, I actually thought something was wrong with me and I was getting sick. Where was my appetite? Where was my desire to munch? If staying full is actually something you want, these certainly do it. I don't think it is just the protein, I think something else in the massive ingredient list is probably a appetite suppressant. 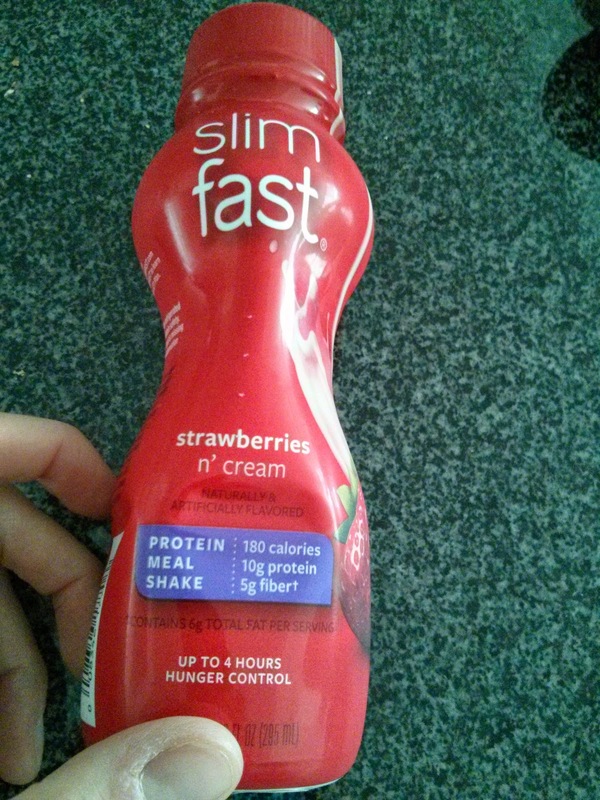 The actual Slimfast plan has you replace both your breakfast and lunch with a shake, which I honestly can't imagine doing, and I'm sure they'd get old very fast, but, uh, for random shakes, they were far tastier than I ever imagined. Fraiche is a yogurt shop in Pacific Heights. Froyo places aren't exactly a rare thing in SF, but Fraiche's approach is a bit different. Their froyo is made from their own yogurt base, using Clover milk, only minimally sweetened. They also serve fresh yogurt, also housemade, in nonfat, 2%, and whole. I tried the nonfat, and it was pretty standard tasting yogurt, not remarkable. Then I tried the whole milk version, and it was much creamier, much better than the nonfat. I could imagine it would make for a nice healthy breakfast, with a fruit topping, but I'm never nearby for breakfast, so I'm not sure when I'd ever have it. Speaking of fruit toppings, their toppings are quite impressive. They offer common ones like fresh fruits, compotes, and nuts, plus chocolate shaved to order, housemade brownies and fruit crisp, even homemade mochi. The toppings are available to add to the fresh yogurt, the frozen yogurt, or oatmeal for breakfast. The menu is rounded out with coffee, Blue Bottle. Seating is fairly plentiful, with tables and a counter with stools inside, and 2 small tables outside. Whenever the weather is remotely nice, those tables are always taken, but I was able to get one once, and it was a lovely place to sit watching the folks strolling by. Service is always friendly, and they love to offer samples of the yogurts, but sadly, Fraiche doesn't rank very high on my list. I think healthy yogurt just isn't my style. Fraiche always offers 4 types of frozen yogurt: fat-free natural, 98% fat-free Valrhona chocolate, 99% fat-free, lactose-free soy, and a seasonal dairy based flavor that changes regularly. They are generous with tastings, so I've tried a few every time I've stopped in. I've never been impressed with the dairy based yogurt, the style is just far icier than I like. The soy one has good flavor, but my body sadly doesn't respond well to soy, so I can't ever order a full cup of it. Small One Topping, Pumpkin, Fruit Compote. $4.45. Since I didn't love the natural, I didn't want chocolate, and I was avoiding soy, I was left with one choice, the seasonal flavor, which was pumpkin. Like all their flavors, it was icy, not creamy. I guess this is the low-fat part coming through. It had some spicing, but not much, so I added cocoa and cinnamon from the coffee bar, which greatly improved things. For my topping, I choose the fruit compote on the recommendation from the server. Not what I'd normally go for, but he said it went great with the pumpkin. 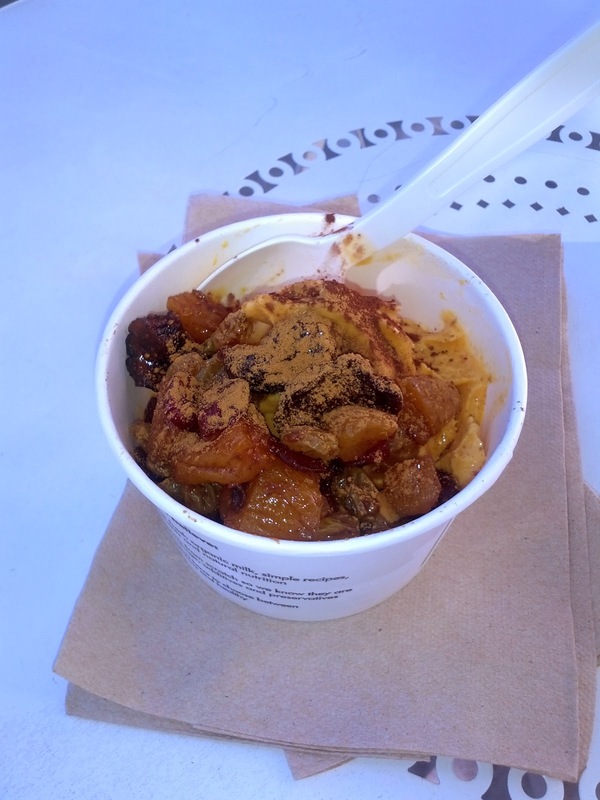 The compote contained stewed golden raisins, cranberries, apricots, figs. It was fine I guess, but just not the right topping for froyo. I think it would work well will the natural yogurt perhaps. I wish I'd picked something else, but nothing seemed quite right to pair with the pumpkin yogurt. Perhaps just chocolate shavings would have worked? The price was fairly high for a small yogurt (he put it in a bigger container for me). $1 of that was for the topping alone, which makes sense for things like homemade brownies, or even the compote like I selected, but much less for sprinkles or nuts, and all toppings are priced the same. Small One Topping, Natural, Apple Crisp. $4.45. On my next visit, I sampled the seasonal offering: Oreo. It didn't really have any Oreo flavor. It was a really strange flavor, very tart and not sweet, and I didn't taste any cookie at all. Plus, it was very, very icy. Although I like the flavor of the soy, I can't eat much soy, so I was left with chocolate or natural as my only options. I didn't ever love the natural before when I'd tried it, but ... then I saw the apple crisp topping. I knew I wanted the crisp, so my decision was made, I had to get the natural, just to go with my topping pick. The yogurt was again more icy than I like, not creamy. It was tart, and not too sweet. Indeed healthy tasting, but just not my style, although I do admit that if you wanted a healthy "treat", you could get this with some fresh fruit topping, and really feel no guilt. But of course I went for the other extreme: the apple crisp! 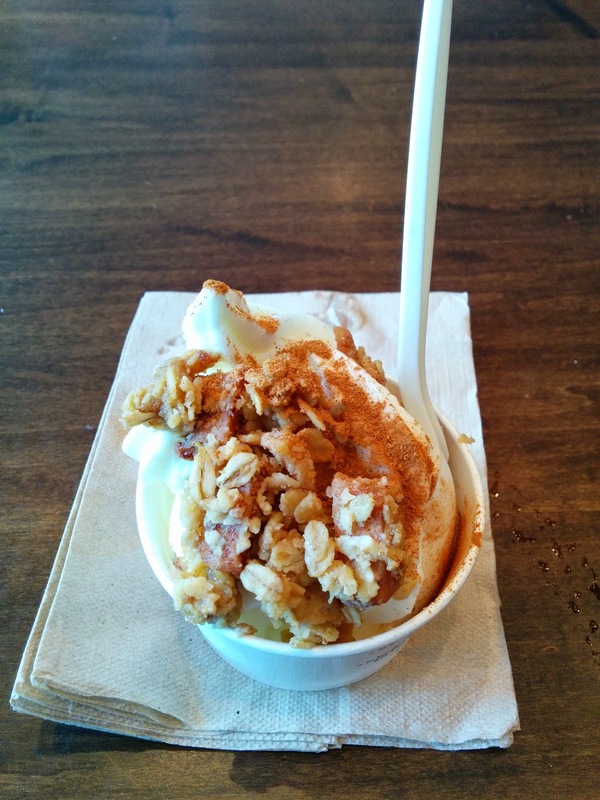 It consisted of spiced apples, and a sweet, cinnamony, crunchy oat topping. I liked it much more than the yogurt itself, and really appreciated that it was offered as an option. Their topping selection is quite impressive in general, quality looking fruit, house made mochi, etc. I enjoyed this creation more than my previous one, but I still didn't love it, and don't really see a reason to return to Fraiche, it just isn't my style. Small One Topping, Natural and Meyer Lemon, Apple Crisp. $4.45. I finally started adding soy back into my diet, so even though I said I wasn't going back to Fraiche, I was excited to swing back into Fraiche on a hot day to finally get to enjoy the soy flavor, since I hadn't ever been impressed with their dairy based yogurts. And ... just my luck, the soy was broken that day! I had the choice of chocolate or natural as usual, or the seasonal special: meyer lemon. I almost turned around and left, since I don't tend to like lemon flavor desserts, and I haven't ever really cared for the natural. But I was there, it was a hot day, so I decided to at least try the lemon. Fraiche is always so generous with letting you sample first. The lemon, like all of their flavors, was an icy style, not creamy, but for a lemon flavor, it actually worked. It reminded me more of a sorbet, which is usually icier. It was tart but also sweet, and the lemon flavor was there, but it wasn't overpowering. I didn't love it, but I didn't hate it. I pondered just getting natural and the apple crisp again, since I remembered liking the apple crisp at least, and didn't think apple crisp would go that well with lemon, and then the person taking my order suggested that I could do a half and half, even though the lemon and natural were on different machines. Yes! I love not having to make decisions, and I didn't realize they'd do a side by side, as many places do not. Both flavors were icier and more "natural" tasting that I prefer, but I actually enjoyed this more than any other visit. 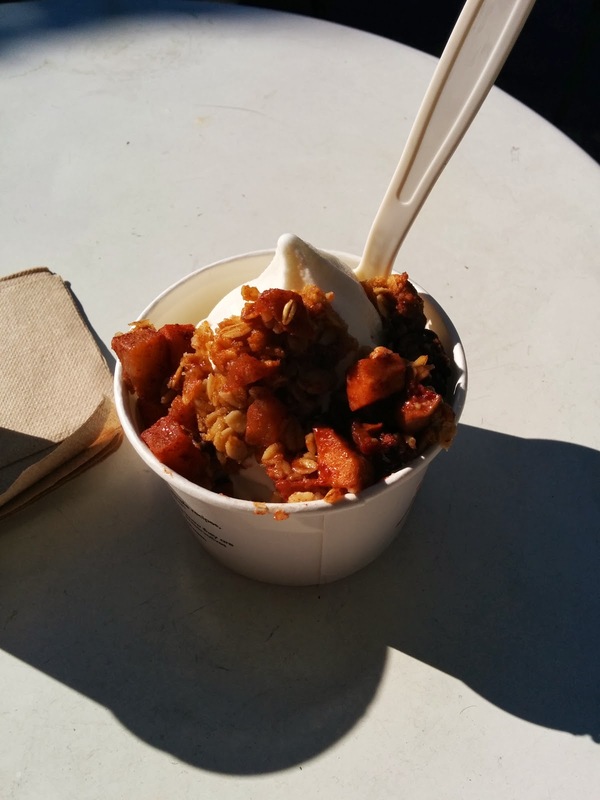 I again liked the apple crisp as a topping, big chunks of nicely cooked apple, oats. I again added more cinnamon on top from the coffee station. I received less apple crisp on this visit than my previous one, but I still felt like I got my $1 worth. I still can't imagine choosing a topping like sprinkles or nuts for $1, but the crisp is really a great deal. To be fair, I think the reason I received less is because she couldn't really fit more, as I got far more froyo than I did on my other visits. I think the side by side was harder to do than she realized, as I certainly wound up with far more froyo than I should in a small. Anyway, this was the best version of Fraiche I've had so far, and perhaps I'm just coming around to their style more, but I still wouldn't go out of my way for it. 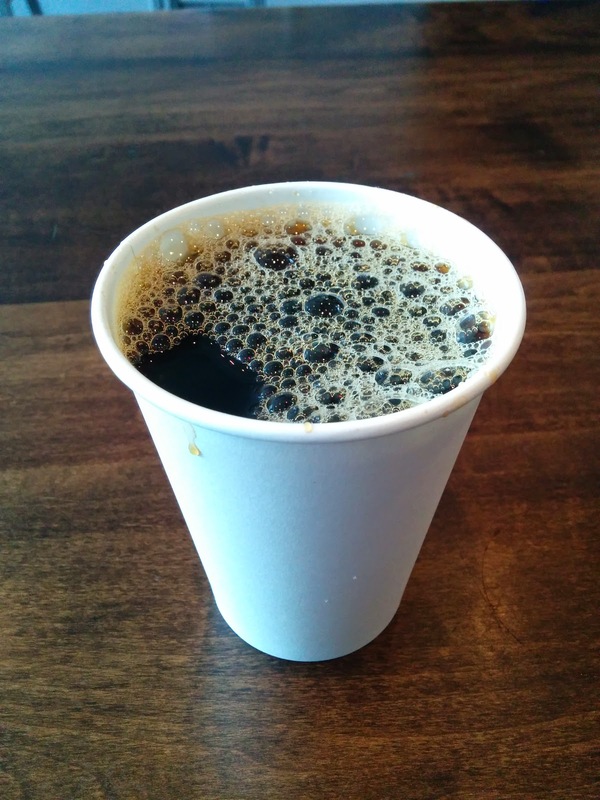 Decaf Drip Coffee (Blue Bottle). $2.95. Another foggy, chilly San Francisco morning ... not exactly the time for froyo. Even I have my limits! Instead, I decided to just get a coffee, once I saw that they carry Blue Bottle. Back in the day, I was a Blue Bottle loyalist (at their Ferry Building location). I became such a coffee snob that I not only drank only Blue Bottle, I had only one or two specific roasts that drank, and only two baristas I would order from. When I switched to decaf, I tried to keep going to Blue Bottle, but I didn't ever like their decaf. A few years of drinking decaf later, all my coffee snobbery has been beaten out of me, so I decided it was time to give Blue Bottle decaf another try. Fraiche brews all their coffee cup at a time, pour over style, just like at a real Blue Bottle location. It took about 5 minutes, but I was told I could take a seat and they'd bring it over to me, even though I got it to go. The coffee was better than I remembered from Blue Bottle's decaf. Maybe they have changed their roast. Maybe I just care less now. Either way, I enjoyed my coffee, and it was the perfect thing for the morning. $2.95 for a pour over was reasonable. Another day, it was a bit brisk out, so I decided to forgo the froyo, and try something else, even though I entered the shop planning to get froyo. Normally, I can't resist froyo, but since I wasn't ever that fond of Fraiche's offerings, I was able to pass it up when I was still shivering just having a sample inside. They carry a nice tea selection and cup at a time Blue Bottle coffee, but for some reason, the chai jumped out at me. I really have no idea why, as I don't ever drink chai. The chai was clearly not just made from a mix. It was strong, in all dimensions. I felt the caffeine surge through me almost instantly. And, they weren't joking with the name, "spicy chai". There was intense spicing to it. For milk choices, they offer standard dairy (Clover, like the yogurt), plus almond or soy, with no upcharges. 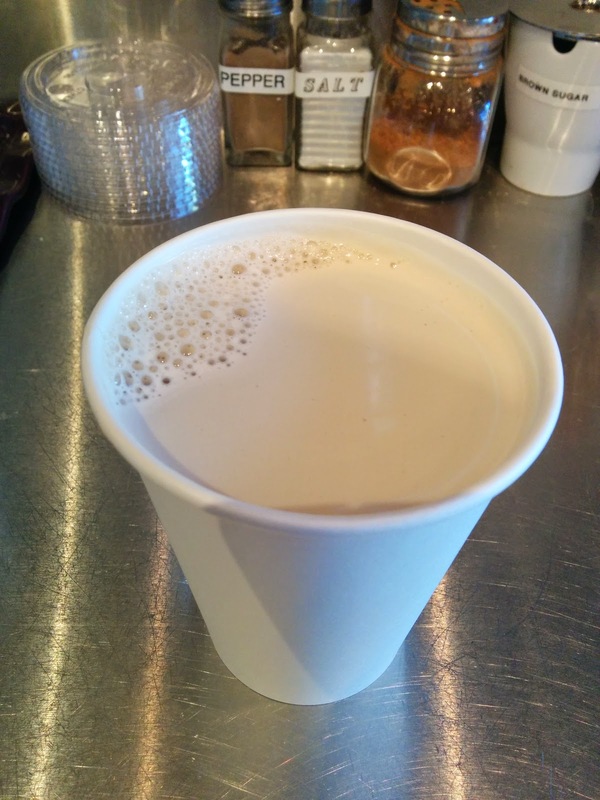 $3.95 was a bit pricey, but it was a housemade chai, and with soy, so it wasn't unreasonable. Claudine is a French "Eatery & Wine Bar", located on the adorable Claude Lane near Union Square. Open for lunch and dinner, and Happy Hour in-between. Claudine is a small casual restaurant. Inside there are only a few tables, plus a bar and counter seats along a window overlooking the lane, but outside there is a tented patio on Claude Lane itself. I dined in the stunning horseshoe shaped bar area, which had a great ambiance. The bar area is located right at the front of the restaurant, surrounded by big, open windows. It was light and airy, and didn't feel at all cramped, even though the restaurant as a whole is quite small. The horseshoe shape was unique, and made for a more intimate setting, as it was easy to talk with the other bar patrons. Service was friendly and efficient, and they even accept PayPal as a payment technique. Unlike many other places that use the PayPal app, it doesn't work by you just checking in. Instead, when the bill arrives, there is a section on paying with PayPal, with a unique code. You then type that into the PayPal app, it brings up your itemized bill, where you can add tip, split the bill with others, and complete the payment. While not quite as seamless as the checking-in version, it makes a lot more sense for a real sit down restaurant, so you can handle the tip and everything without needing to visit a register. Like most of my PayPal adventures, it was really easy to pay this way, and I greatly prefer it to any other mobile method I've tried. Crème brûlée: Vanilla custard, caramelized brown sugar, raspberries. $8. It is no secret that I eat a lot of desserts. I obviously have a serious sweet tooth. And in many cases, I'm not the most discerning when it comes to desserts. Sure, I have preferences of course, but when it comes to desserts, my extreme pickiness just goes out the door. Jell-o mold mixed with Cool whip? Sure! 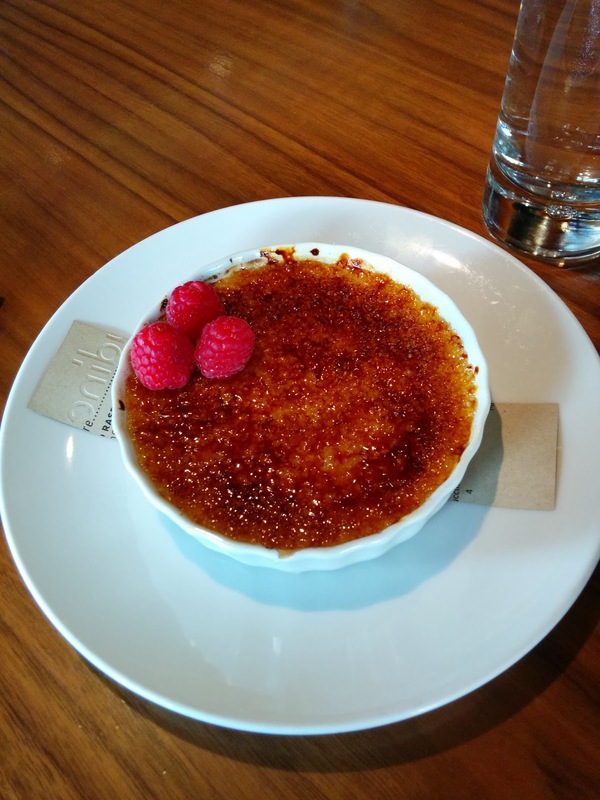 There is one dessert that I love more than most, in concept at least, yet so often dislike when I actually have it: crème brûlée. I love it so much that my blog has a label for it. I love it so much, when done "right", that I'm still willing to order it whenever it is on the menu, even though I'm pretty sure I'll be met with disappointment. My expectations and requirements for it are extreme, and I know it, but, I want it a very particular way. I was at Claudine because they are known for the crème brûlée. The Yelpers all say it is great. But ... when is the last time I trusted the Yelpers? I still went for it. And ... Claudine nailed it. Seriously nailed it. They hit every element of what defines the "right" way to execute a crème brûlée, at least in my mind. First, the "tap test". You know, when you take your spoon and tap on the surface of the crème brûlée. It shouldn't just go right through, like the one from Amber Dhara, or the ones I've tried from the namesake Crème Brûlée Cart. But it also shouldn't be a pain to crack through with every bite. I tapped ... perfect. Thick enough to provide a real deep caramelized flavor with every bite, but not burnt tasting. The top layer passed my test on both thickness and flavor. Since it was served in a wider, more shallow dish rather than a standard crème brûlée ramekin, this also provided more top surface area, so there were even more bits of caramelized goodness than usual. Very well done. Next, the temperature. It should be hot on top, showing that it was just freshly brûléed to order. But the lower level should be cool. I love that contrast of hot and cold in the same bite. I can't stand it when crème brûlée has been torched in advance, and the whole thing is cold when served. Claudine's version passed here as well. And finally, the custard itself. Not too thick, not too thin. Not watery like the one from Pläj nor too thick and quiche-y like the one from Alexander's Steakhouse. It was a simple vanilla crème brûlée, nothing fancy like the eggnog version from Home Hill Inn, or the total failure of a foie gras version from The Village Pub. Simple yes, but the vanilla flavor was intense, and there were visible flecks of vanilla bean throughout. You don't need to mix it up with other flavors when the base is this good. For garnish, there were three raspberries, which added to the presentation, but I didn't really need. Simplicity again, no need to re-imagine it like the "crème brûlée" from Fifth Floor, or the Mandarin Dreamsicle Brûlée from Boulevard, that came with a foam on top, and an ice cream sandwich on the side. This was crème brûlée perfection. I'd call it "textbook", and I mean that as a ultimate compliment, as it exemplifies how crème brûlée should be done. The portion size would be fine for sharing with one other person after a meal, or, in my case, devouring myself as a mid-day treat. It would go great with a cup of coffee, or a glass of wine, as an anytime snack. The $8 price tag was totally reasonable. I'll be back for this. And if you like crème brûlée, you should stop playing on the internet, and go now too! If you've been following my blog, you know that I recently visited Tokyo for a business trip. After sitting in a room for meetings all week, I had a few free days to do my type of exploring: fine dining. Tokyo has more Michelin stars than anywhere else, and I was determined to cram in as many as possible in our very short time. Luckily, my co-workers (and friends who flew in to join us for the weekend), were happy to entertain my ridiculous agenda. On Saturday, we started with a 2 Michelin star lunch at Tateru Yoshino, that was pretty mediocre, and we didn't really feel double Michelin star worthy. Things improved as we moved on to dinner that night at L'Atelier de Joël Robuchon, another 2 Michelin stars, and the most casual of Joël Robuchon's restaurants in Tokyo. That meal was quite good, and certainly worthy of the star rating. Lunch the next day was a quick break from French cuisine: Michelin star sushi at Sushi Kanesaka. And for dinner, it was time for another 2 Michelin stars, this time at another one of Joël Robuchon's establishments: La Table. La Table is located on the first floor of the chateau with his flagship restaurant in Tokyo. That one has 3 Michelin stars. We settled for the more casual La Table, since we didn't have the proper attire (or, checkbooks) to handle the best one. La Table is still much more formal than L'Atelier, where we'd dined the night before, even though they are both 2 stars. And just like L'Atelier, it was incredibly reasonably priced. We all chose the smallest set menu, consisting of an amuse bouche, bread service, our choice of appetizer, choice of main, dessert, coffee/tea, and mignardises, for only ¥6,300 (~$63). I was again blown away by the pricing. So many courses, multiple Michelin stars, very, very reasonable for dinner. Had we desired larger meals, we could have opted for the ¥8,800 option that included a second appetizer, or the ¥12,800 set with two appetizers and two mains. Of course, a tasting menu of ￥16,000 is also offered. Chef Robuchon has 28 Michelin stars throughout the world, the most of any chef. It is clear to see why. Our meal the day before at L'Atelier was very good, the execution of every dish total perfection. But our meal at La Table was in another league entirely. The execution was again perfect, but this time, the creativity of the dishes was much higher. If this is what a 2 star establishment of his is like, I can only imagine how amazing the experience is upstairs in this 3 star. Next time ... maybe (for comparison, the meal prices there are substantially more:￥22,500, ￥36,000, or ￥40,000). Just like at L'Atelier, I was struck by the decor the moment I walked in, not that they were at all similar. L'Atelier is decorated in rich red tones, casual elegant, surrounding a large open kitchen. La Table is more formal, with tea candles on the table, velvet ribbons on the napkins, and purse stools. However there are still no white cloth tablecloths, keeping it comfortable feeling. Instead of red, the color palate is royal purple. Even the water glasses were a shade of purple. Just as stunning as the red tones. I loved it. The only aspect of the decor that I didn't like were the stools we were seated on, as they made it a bit hard to sit up properly. Happy Group, looking forward to our dinner. We started with a few cocktails and champagne, and then our orders were eventually taken. Service throughout was good, albeit a bit slow. Amuse Bouche: Carrot Mousse with Orange Espuma. The first thing to arrive was the amuse bouche of a comforting chilled carrot mousse, topped with a thin layer gelee that we couldn't identify, and a layer of frothy orange espuma. The mousse was very creamy, and well, yes, carroty. The espuma was a bit sweet, but balanced by rosemary. I really appreciated the balance of flavors, a bit sweet but also a bit savory. A great way to wake up the palette! Bread Service: Baguette, Brioche. Olive Oil with Dot of Balsamic. Next came bread service, the only disappointment in the entire meal. The bread was served cold. Sigh, I always prefer warm bread. At L'Atelier the night before it was also served cold, but I liked that bread far better. The brioche was light and fluffy, but not very buttery, and not remarkable. The baguette was very crusty, and seemed perhaps whole wheat. A second bread service, which I declined, contained slices of baguette. At L'Atelier we were not provided butter or oil, and this was a step up. We were all impressed that the waitstaff carried over the little bowls of olive oil without disrupting the tiny dot of balsamic. The olive oil was clearly high quality, with a strong grassy undertone. Appetizer: LA NOIX DE SAINT-JACQUES marinée et servie avec une crème à l’oursin et caviar, coulis de poivron rouge. +¥1,050. For the appetizer course, we had 7 options to pick from. I wanted almost all of them. Luckily for me, Emil also wanted almost all of them, and agreed that we'd split 2. Narrowing down to just 2 was hard enough, I don't know how I would have picked just one! We passed up the lobster, the meats, and, gasp, even the foie. You know that for us to pass up foie meant there were some pretty amazing sounding other options. Like ... the scallops, described as "marinated scallops accompanied with caviar and sea urchin cream, red bell pepper coulis". Scallops, uni, and caviar, all in one dish? We couldn't resist this one. I was surprised when the dish arrived, as it wasn't a skimpy appetizer portion. Instead, a very generously sized dish of 6 scallops, each topped with a dollop of crème fraîche, a bit of uni cream, caviar, and even gold leaf and a flower petal. Stunning. The scallops I think were raw, marinated in a way that made them seem almost cooked. The uni cream wasn't as intensely flavored as I would have hoped, but perhaps a stronger flavor would have wiped out the delicate scallops. The caviar was totally lost amongst all of the other components. I loved all of the ingredients, but I felt a bit like they weren't quite the right combination to have together. This was a really stunning dish, and a good lighter option to start the meal. It carried a ¥1,050 supplement, which was justified by the slew of higher end ingredients used. It was good, but the best was yet to come. Appetizer: LE TOPINAMBOUR en cappuccino sur une royale de crustacé. The other appetizer we picked was the Jerusalem artichoke velouté, served on a crustacean custard. I kinda adore sunchokes, so I really wanted to try this one. Another visual stunner, both the vessel it was in, and the garnish on top (which, of course included truffle). The velouté was incredibly frothy, delicately salty, but the flavor very light. I wouldn't have known it was sunchoke. Underneath was a chowder-like custard, filled with bits of assorted seafood. I really liked all of the textural contrasts, from the frothy top, the firmer custard, and the bits of chew from the seafood. This was good, and another light start to the meal, but did disappointment me slightly since I really wanted to taste the sunchoke. My (slight) disappointment did not last long, as the meal just kept getting better. Main Dish: LES SPAGHETTIS aux langues d’oursin avec un œuf mi-cuit et une crème légère. +¥1,890. It was time for our main dishes. Just like the appetizers, there were way too many amazing sounding choices, 8 total, and I wanted most of them. Emil again agreed to split with me so we could enjoy more dishes. First, I started with the pasta dish, described as "sea urchin spaghettis served with a soft boiled egg and cream emulsion". It was topped with a bacon foam and truffles. Like it needed more awesomeness. OMG. This was the dish of the night, the dish of the trip, one of the best dishes I've ever had. The pasta was perfectly cooked, al dente, a bit of bite. The sauce, so creamy and rich, topped with shaved parmesan. Even just those components made a stunning dish, probably the best pasta dish I've ever had, anywhere But, it didn't stop there. A layer of froth covered the dish, which I initially took one look at and rolled my eyes. Sigh, foam. Trendy. But this wasn't just foam, it was bacon foam, and yes, tasted intensely like bacon. Who doesn't love bacon? A soft boiled egg lay hidden under the foam. I don't really love eggs, but I discovered in Japan that their eggs are different. Jidori eggs are a thing of wonder, the yolk larger, more intense. And this egg was no exception to my newfound love of eggs. Once cut into, the slightly runny yolk coated the pasta, adding yet another layer of richness and flavor. At this point, it was basically like the most amazing carbonara I'd ever consumed. But it just keeps getting better. Generous, generous hunks of uni. So much uni. I love uni, but sometimes it can be a bit funky. Not here. It was creamy, even a bit sweet, perfect. It somehow didn't get lost in the dish, the uni flavor was incredibly strong, so if you don't love uni, this was certainly not the dish for you. But for me? Yes. And, the grand finale, several large slices of truffle, providing an earthiness, but not necessary for me. Emil of course loved them. I honestly couldn't believe how delicious this was. I savored every single bite. I started with this dish, and had only consumed about 1/3, when I could see that Emil was waiting for me to switch. The other dish looked good, but I was devastated on the inside as I handed it over, knowing there was no way it could compare. So we switched. And, somehow, Emil saw what was going on. Perhaps my face reveals more than I realize. Perhaps I was sitting there talking about how that pasta dish was the best thing I'd ever consumed. Perhaps he is just awesome. Either way, after taking a few bites, he offered to switch back with me. I know he loved the pasta too, and was just being generous. I probably should have said, "oh no, it is ok, eat your half" and then taken my final remaining few bites. But, I couldn't. I loved it too much. I gladly took the rest back, and devoured it within seconds. It cost an additional ¥1,890, and was worth every penny. Main Dish: LE TURBOT gratiné à la poutargue avec une romaine farcie aux oignons confits. The second entree we picked was a fish dish, "gratinated Halibut with dry mullet roe, romaine lettuce with onion confit." Now, this was good, don't get me wrong. I enjoy halibut. Like everything at Robuchon's restaurants, the fish was perfectly cooked. It had a lovely crust on it, was tender and flaky. Cooked in a butter and cream sauce. These are good things. The brown sauce drizzled on the plate was a smoked bacon sauce, and inside the lettuce leaf was bacon confit. There was sooo much bacon flavor in this dish, undeniable bacon goodness. This was good. But, honestly, I couldn't get past the uni pasta. Everything else paled in comparison. Main Dish: LA LANGOUSTINE coraillée servie avec une sauce épicée et des pâtes à la mousse de crevette. +¥1,575. One of my other dining companions picked this dish, "Panfried Dublin Bay Prawn with a spicy gravy, pasta with shrimp mousse." Over the course of the trip, he had a knack for picking the best dishes everywhere, and causing quite a bit of food envy for me. But not this time. I looked good, he said it was good, but I was so in love with my pasta that it didn't matter. This also carried a supplement of ¥1,575, which seemed a bit odd, as it didn't have any premium ingredients, and the other main dishes didn't have supplements. The diner who had this dish also said that it was too small for a main dish, and he was left hungry. Dessert: L'ALMONDO blanc manger à l'amande douce, fruits rouge et noirs sorbet à la muroise. And finally, time for dessert, always a highlight for me. We had only 3 options, and none of them sounded amazing. I went for the blanc manger, since I do love puddings, described as "blanc manger served with red berries and a red berries sherbet." I was a bit surprised when this showed up. The thin white chocolate layer on top was beautiful, and mimicked the similar artistic style that we had seen earlier in the plating of the scallop and velouté dishes. But where was my blanc manger? I pushed aside the white chocolate to reveal the contents hidden beneath. It wasn't really what I'd think of as a blanc manger. A ball of strawberry sherbet was in the center. It was good, sweet, fruity, flavorful, but just sherbet. The custard was creamy, lightly almond flavored. Also within were whole blueberries and blackberries, providing additional fruitiness and a cookie crumble for some crunch. This was all fine, but not all that memorable, and not really the style of dessert I prefer anyway. Dessert: LES AGRUMES avec une gelée de citronnelle et une crème au fromage frais. The other dessert choice my companions ordered was the "seasonal citrus fruits served with a lemongrass jelly and a cottage cheese cream." It had a mandarin sorbet, passion fruit, lemongrass gelee cubes, and a mascarpone cream. I took a few bites to try it, and they were fine, very citrusy and fruity, but this wasn't really my style. Freeze dried passion fruit and banana. Their desserts also came with a bag of freeze dried fruit to sprinkle on. Emil didn't want his, so I tried it just on its own. It was intensely flavorful and crispy, and I see how it would accent that dish well. A bit strange that they were provided on the side in a bag like this however. Finally, like all set meals in Tokyo, we were offered tea or coffee. I went for the decaf coffee, and, like everywhere else, it wasn't good. Very bitter. Mignardises: walnut brownie, caramel, macaron. And of course, we each received a plate of migs with our coffee. I'm pretty sure everywhere we went gave us caramels. And macarons. The brownie was a bit more unique, sweet, with a crunch from the walnuts. But, not remarkable. Our wine selections for the night, picked by two of my dining companions. I didn't take notes on these, but I know I enjoyed them very much, particularly the bubbles we started with! Unreal is a company that takes classic chocolate junk foods, and "unjunks" them. 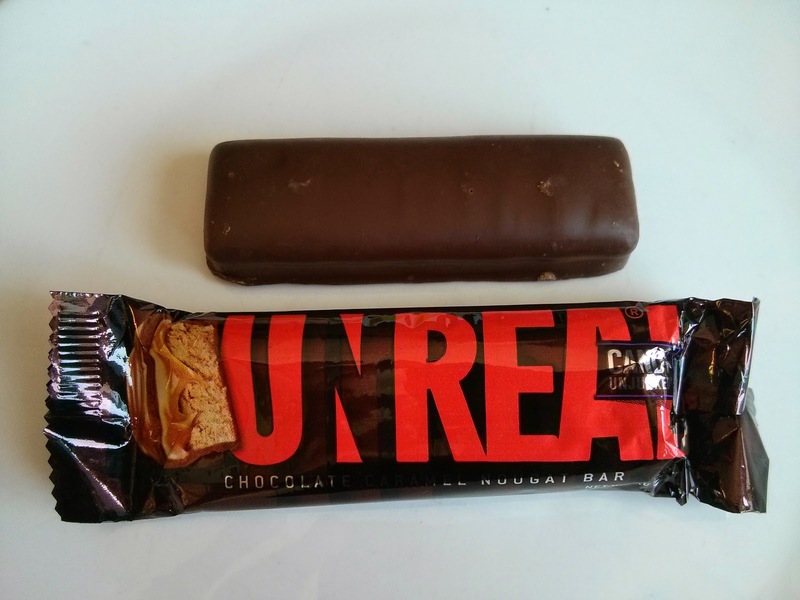 "UNREAL reinvented your favorite candy with 100% real ingredients and none of the junk. No corn syrup, preservatives, GMOs, gluten and excess sugar. Instead, they use only the good stuff like real mike chocolate, caramel, peanut butter and cane sugar." They have picked all the heavy hitters and make their own version of M&Ms ("chocolate gems"), Snickers, Milky Way ("Chocolate Caramel Nougat Bar"), and of course, Peanut Butter Cups (and almond butter cups, and crispy versions, and dark chocolate versions ...). They do certainly taste more real. And the chocolate is much better quality. But, overall, I don't find myself picking them over the classics. Sometimes, classics are just that. Peanut Butter Cups (Milk Chocolate). 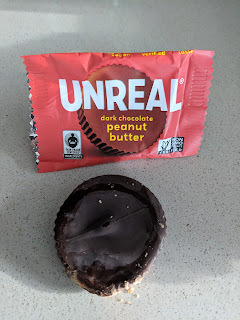 As you can guess, this is the Unreal version of Reese's peanut butter cups. The milk chocolate was smooth, the filling substantial. There is more peanut butter filling in here than in Reese's. And, actual peanuts. You could really taste the peanuts, rather than just sugar and corn syrup. But, I didn't love them. Not sure why, at some level, I think they somehow tasted too healthy? I'll have to try again when I'm in a different mood. "Peanut buttery, dark chocolate perfection! Creamy peanut butter and melt-in-your-mouth dark chocolate combine for a truly delectable treat." They also make a dark chocolate version. Again, I could tell the chocolate was higher quality, although it was still a pretty sweet dark chocolate. Smooth though. 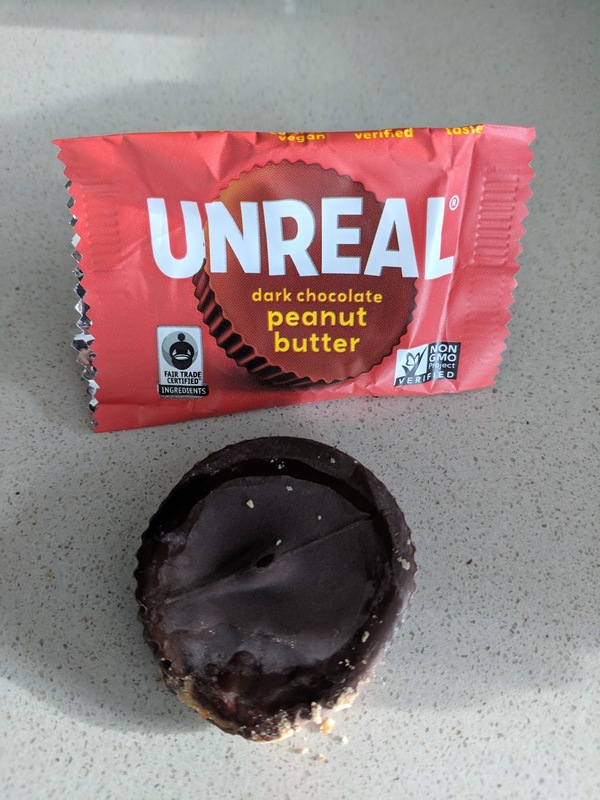 And again, a lot more filling than a traditional peanut butter cup, and, again, too ... healthy tasting. It wasn't as sweet, it wasn't as interesting. 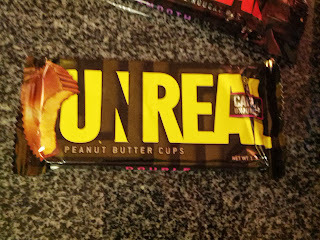 I wanted to like this, as I like chocolate and peanut butter together so much, but, alas, it just wasn't right for me. Dark Chocolate Crispy Peanut Butter Cup. "Peanut Butter Cup perfection with a happy crunch of quinoa! Unreal Dark Chocolate Peanut Butter Cups with Crispy Quinoa combine the perfect mix of textures in one satisfying treat -- with creamy peanut butter melt-in-your-mouth dark chocolate and crunchy toasted quinoa." 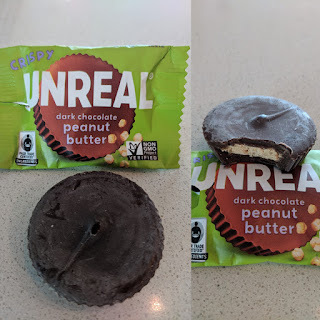 Still decent dark chocolate, more peanut filling than a standard peanut butter cup, but, I just don’t care for this peanut butter. It … isn’t decadent enough. The crispy factor comes from … quinoa. I kinda laughed when I saw that. Crispy chocolate bars usually use rice, so, of course, how do you healthy it up? Quinoa! The crunch was a nice addition, and it didn’t actually taste like quinoa, so this was fine. But still, this brand just isn’t for me. I guess I like unhealthy candy. Next I tried the "Chocolate Caramel Nougat Bar", or, their version of a Milky Way. The nougat was very dense, not fluffy and marshmallowy like a Milky Way. The caramel was very thick, I would have preferred runnier. The chocolate was unremarkable, but far better than Mars. 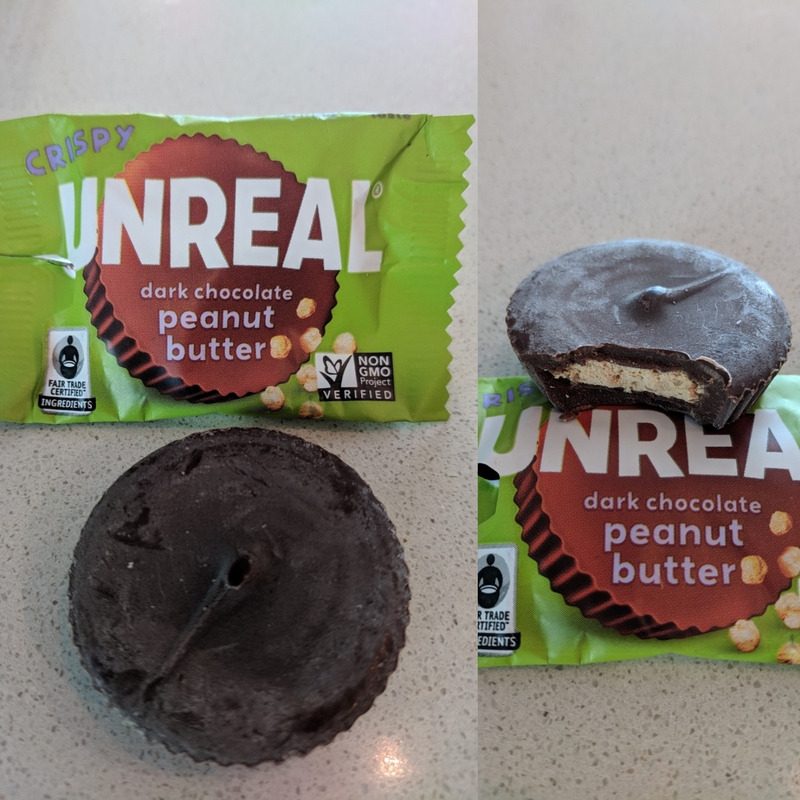 Sadly, I preferred the classic Milky Way, just because I love their fluffy nougat so much more, but Unreal certainly wins on chocolate quality. Others in the group thought this was not as sweet as Milky Way, and preferred it.